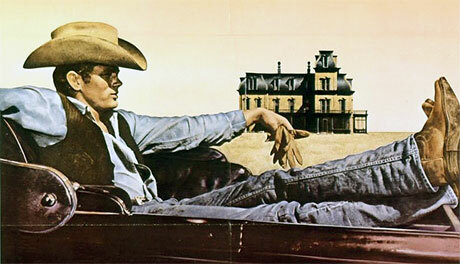 Jeans make you think of Levi Strauss, cowboys, Rock and Roll, James Dean, Marlon Brando. Blue Denim has “America” written all over it. James Dean wearing jeans in Giant. How more American can you get? But the jeans that American companies like Lee, Levi’s and Wrangler make are but a shadow of the jeans that America gave birth to. Production of raw, unwashed denim was discontinued in the US in the 1960s, and now almost all you can get is pre-washed and artificial. In Japan, however, the unadulterated spirit of blue denim is alive and kicking. True selvedge denim, produced on age-old looms and often featuring rivets and pocket stitching. And although most commercial denim is 12 ounces or less per square yard, Japan’s selvedge denim usually weighs in at 13 to 15 ounces, and even 24 ounces. Courtesy of the old narrow looms that are used to produce it. What makes Japanese jeans especially stand out is the centuries old aizome dyeing method, which uses the leaves of the indigo plant instead of chemicals from a factory. This color is as Japanese as kimono and sushi. Japan’s natural indigo gives very subtle hues and shades, and a depth that no chemical color can reproduce. More importantly, it gives the garment soul. Something that author Lafcadio Hearn (1850-1904) recognized way back in the late 1800s: “Japan is a country filled with a mystical blue color,” he wrote. The combination of using old and slow narrow looms and natural hand dyed colors give Japanese jeans that handcrafted look that has long been lost in the US. Each finished product is slightly different. This “imperfection” of handcrafted Japanese jeans actually makes them perfect. It is truly ironic that Japan’s strict adherence to low-technology that elsewhere in the world no one wants to use anymore, has made the country the world’s leader in denim production. Back in the 1980s, Japanese tailor Hidehiko Yamane wanted to make exceptional jeans for demanding denim lovers like himself. Soon a cult product was born, Evisu jeans. Named after Ebisu, one of the Seven Gods of Fortune and in Yamane’s hometown Osaka an important guardian of business people, Yamane’s jeans are as extravagant as the jolly god himself. They are made from pure American cotton and instead of fading, they develop a unique olive-like hue. The loosely woven Evisu jeans also shrink when washed, allowing them to adjust to the wearer. Prices are only a bit extravagant. 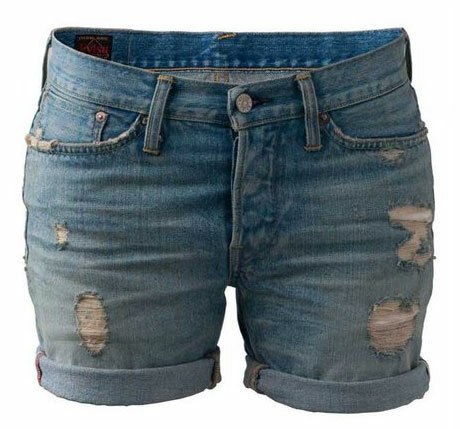 The Womens Soni Boyfriend Shorts pictured above sell for 225.00 US dollars. 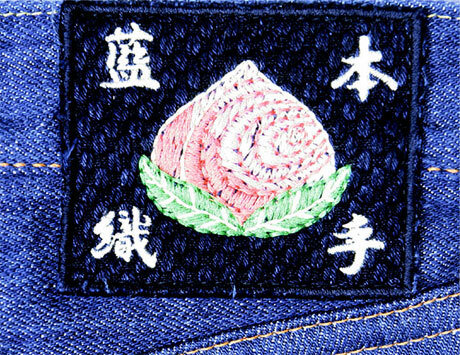 Momotaro Jeans are named after another mythological character: Momotaro, an enormously powerful and brave boy who jumped out of a gigantic peach floating down a river. Hence the cute pink peach in the company’s logo. The jeans are made around Momotaro’s mythical place of birth, Okayama, since hundreds of years Japan’s capital of cotton weavers. It was actually here that Japan’s first fully domestic jeans were created in 1973. Since then, Okayama, and neighboring Hiroshima, have become the world’s mecca for denim designers. Fashion designers from all over the world visit here regularly. 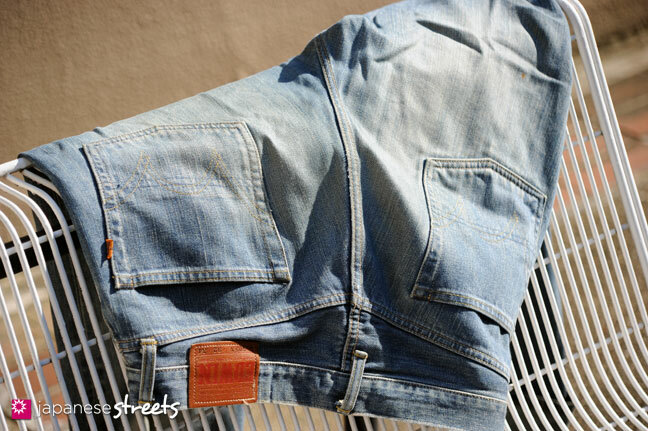 Momotaro Jeans’ high quality stems from several sources. An important one is the cotton used. The company only uses handpicked Zimbabwe Cotton. This cotton provides a high luster, while its well-proportioned fiber structure makes it pliable and perfect for dyeing. When Zimbabwe cotton is dyed with a traditional artisan method called Sho-Ai (True or Natural Indigo) which uses water to which lime, sugar and sake are added, it creates a unique vertical fade. This is known as Tateochi. The company also employs rope dyeing. This is a technique that keeps the core of the denim thread white, thereby producing a bolder patina. Momotaro Jeans’ traditional way of dyeing is combined with using special looms. One of its looms is one of only two in the world! It takes at least three days to finish the denim on this original hand weaving machine, and requires adjusting the tension on the loom according to the temperature and humidity of the day. This creates a quality, clear uneven surface and color that few, if any, competitors can match. Momotaro Jeans receive their finishing touches on special vintage sewing machines that have been replaced with modern equipment just about everywhere else. The company’s slogan is Made by hand without compromise. Prices reflect that. Although the company offers products over a wide range of prices, the most exclusive Momotaro Jeans set you back a cool 2,000 dollars. For more info on Momotaro Jeans, see the excellent article at Selvage & Such. Founded only in 1997, Osaka based Samurai Jeans has already managed to establish itself as an unwashed selvage denim producer for connoisseurs. 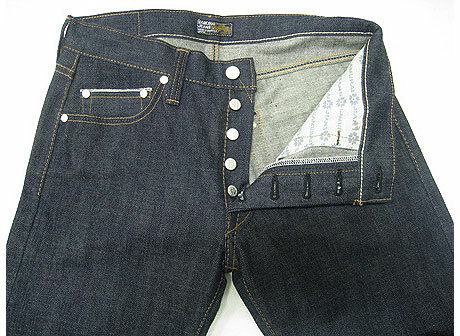 The company sells simple but stylish jeans of extremely high quality that are often sold in limited editions. The company loves to experiment, and in the past is known to have even dyed jeans with persimmon juice. The company’s jeans are as tough and heavy as they get, 17 to 24 ounces. I have seen photos of Samurai Jeans that stood straight up without any support. The average jeans would need a bucket full of glue to accomplish that. Samurai Jeans fade exceedingly well, giving a contrast between the dark hand dyed indigo and bright white cotton that is impossible to achieve with mass-produced jeans. • Have I missed any high quality Japanese denim brands that should absolutely positively be on this list? • Which Japanese denim brand is your favorite? And Why? Our sponsor Rakuten recently created a special corner in its online shopping mall specifically for Japanese jeans. Full disclosure: this article is not sponsored, neither are any of the links above, nor the banner below. This is solely a service to our readers to help you find some of these great Japanese jeans for yourself. @Mel: I love the fly buttons on Samurai Jeans. wow! loved the article! 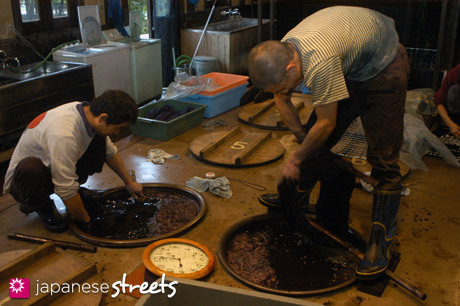 I’m sure some of it came from our “talk” about indigo dyeing and traditional Japanese dyes. thank you for a great article! PS – didn’t know John Bull is Japanese! I would love a pair of Japanese selvage jeans, but I fear that the typical Japanese, um, silhouette would not accommodate my own. I wonder if I could get a pair custom made…? Not that I’m rich or anything… I simply appreciate good, well-made clothes and I’m willing to pay the price for them. @kagitsune: Many of these companies now export all over the world and produce for the Western silhouette. I am pretty sure you can find some jeans that look great on you. Take your time going through the enormous Rakuten Denim Catalog I’d imagine you will find something. You could also try contacting some of the companies directly with your concerns through the links in the above article. They may be able to advise you. I love the style of jeans that the japanese have, but I am hesitant to get a pair because I am worried they may not fit my body size like it would for girls over there. The origin of denim, the cloth used for making jeans, can be traced back to somewhere around the 18th century. During that time, it was made by mixing together a number of materials. With the increase in the practices of trade, slave labor and cotton plantations, ‘jeans cloth’ came to be made completely from cotton. The working class started favoring the material as it was very strong and did not wear out easily. The material was dyed with indigo, taken from American plants, thus giving the trademark color of ‘blue’ to jeans. @Leonashelly: Thanks for this additional piece of history. I had purposefully left it out as the article was becoming quite long, so it is very helpful to have it in the comments. Just curious – where would you recommend purchasing these labels in Tokyo? @Naomi: Good question! Harajuku is filled with so many incredible shops carrying great jeans, from Laforet to shops in the backstreets (Urahara), that I find it impossible to say this one or that one. I recommend to just dive into Harajuku and check out each shop that catches your fancy, including the many great used clothing stores. And of course, visit the shops that each jeans brand owns and runs; they are listed on their websites. @MrQuick: Thanks. I have added Iron Heart to the list of other brands. Good day to you and your entire team. It is indeed pleasure to contact you today. We are the manufacturer and direct exporter of natural indigo blue dye and natural indigo leaf powder (indigofera tinctoria) and natural henna powder (fresh harvest). Our product indigo blue contains 40- 45% of indigotin content. I am also in denim business. Would like to have any kind of comments. Can anyone tell me about denim comunity ozone since1978,is it japan brand…….? ?is it valuable or not?